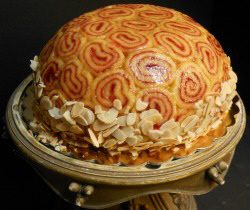 Passover Roulade A delightful dome shaped almond cake with apricot, Triple-sec mousse, and raspberry filled jellyrolls. 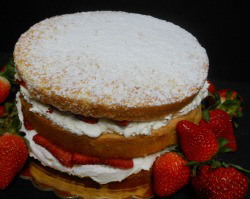 Passover Strawberries & Whipped Cream Flourless almond cake with layers of fresh strawberries and whipped cream. Chocolate Decadence Cake Truffle-like dense chocolate cake made without flour. Topped with a generous amount of whipped cream. Chocolate Sin Almost like eating a brownie. No-flour chocolate cake w/powdered sugar dusting. Irresistible! 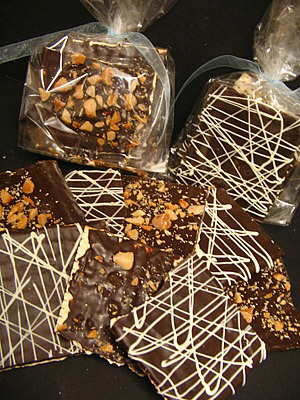 Matzo Bark Choose from Matzo covered with white and dark chocolate -Or- We add toasted macadamia nuts. Almond Horns Horseshoe shaped marzipan cookie rolled in slivered almonds with chocolate dipped end. *Please note Freeport Bakery is not a Kosher bakery. Our Passover baked items are made without ﬂour or leavening.